At some time or another everyone dreams of being successful and famous. Some very successful people have figured out that the secret to their successful morning means dressing in less. 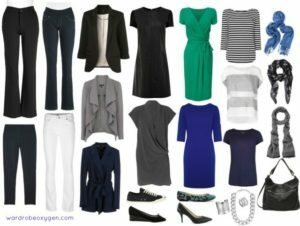 We’re not talking about going to work barely covered, we’re talking about simplicity–that is pairing the closet down to the same kinds of clothes–and wearing them over and over. It’s the joy of a streamlined, simplified closet. Before you dismiss it as boring, let’s look at who has done it. Steve Jobs: The Apple co-founder wore a black mock turtleneck, blue jeans and New Balance sneakers. Mark Zuckerberg: Facebook’s chief executive wears a grey t-shirt or hoodie. Recently I saw him in a grey suit and I had to do a double take because he had broken his own dress code. Albert Einstein: The famous physicist wore a grey suit, no socks, and unkempt hair. Barack Obama: President Obama pared his closet down to only blue or grey suits. These people have figured out that they don’t have to think about how to dress for the day. They wear the same thing. Mornings in my house are chaotic. The dog needs fed. My spouse has to get to work, and the kiddos need nutritious lunches to take to school, and I need to steal a little time to pull myself together for the day. I hope you are telling yourself about your own getting ready for the day story right now. Life for each of us is different, but we can relate in the hecticness of getting everyone to the right place at the right time, with all the necessities to succeed for the day. In a perfect world the clothes are laid out and lunches are made the night before. Yada, yada. Who lives in a perfect world? I sure don’t. What about you? What if you had just one less decision to make each morning? What if it started by having less clothing? Most of us don’t have someone to get the kids ready for us, and we have to prepare our own lunches etc. We have even less time to accomplish more than the people above, and we have to do it on our own. What if mental morning health starts by redefining your closet with fewer items and less to think about? And, that success affects the amount of green stuff in your wallet. You may be surprised that you’ll actually have a healthier, fatter wallet, and more Benjamins to spend. If you are getting out of debt, it could be the way to get momentum and pay off some smaller debts on your way to bigger changes and more financial freedom. Courtney Carver, a former advertising sales executive started the experiment about six years ago. “You are really learning what ‘enough’ is,” she said. For her the financial payoff was in excess of $5K annually. “When I go to shop, I’m not lured in by the marketing,” she said. A minimalist wardrobe doesn’t have to be devoid of fashion and creativity. Let’s see how it is done. Chivalry isn’t dead. I’d address a lady’s closet first, but she will probably read through the men’s section to see how she can help him through the less is more approach. The converse may not be true. Don’t confuse a fewer number of clothing items with being devoid of fashion. If you are a man who takes heed about fashion you can still do this. Even Don Draper can do it. It might look like this. 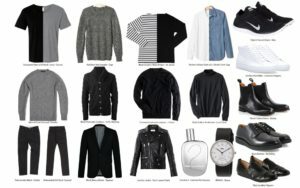 Neutral Colors: Predominantly black and white, but can also include navy and denim, cream, and shades of grey. Mix and Match: By keeping it simple, everything mixes and matches together. Attention to Fit: Clothes are neither figure-hugging or baggy and are a comfortable fit. Prints: not too many patterned or floral fabrics, maybe because they are harder to mix and match. Instead, Breton stripes, or limited power pieces. Texture: To add interest to an outfit, they may include textured fabrics such as tweed or lace. Footwear: Suitable styles for walking around Paris are flat ballet pumps or sandals, and in the winter a pair of boots. Medium height heels are also an option if they are suitable for walking around. Shoes are also in neutral colours for easy mixing and matching with the clothes. Accessories: This is where the fun comes! Chic women focus on a few well-chosen, good quality accessories to pull an outfit together and provide and individual look. Accessories enable you to play dress up. They may include a neutral coloured leather bag, pearls, a silk scarf, a beautiful necklace or bracelet, or hosiery. Scarves: Wearing scarves and tie them in a variety of different ways. If you are new to simplifying your mind, your morning routine and your closet, but think you’d like to give it a try, start small. In my house we begin each New Year by turning all the hangers backward. As items get worn, washed, and returned to the closet, they get hung from the front. Any hangers facing backward by the end of the year get pulled, bagged, and sent to Goodwill. If an item hasn’t been used in a year someone else needs it worse me. The key is to buy high quality items that last over time, and multiple washings, versus ones that fade and wear out quickly. It is easier to shop when you know what needs to be replaced. It’s easier to avoid sales, and items that won’t leave the closet too. You will have more disposable income. You will have more time to live your life. Mornings will feature less stress. Laundry days will be easier. Kids figure this out when they are young. They fall in love with a favorite shirt, and wear it over and over until it is threadbare. Or, sleep in clothes because they love the feel. They wake up the next morning, roll outta bed, and don’t care if they are a wrinkled mess, or if they coordinate. They don’t care what they wear. It’s parents who are prideful about what kids wear. Kids wear what they love. Maybe we should do the same.